After reading about and watching videos of other people making beef sandwiches, I decided to take my own traditional indoor recipe outdoors to my kamado. 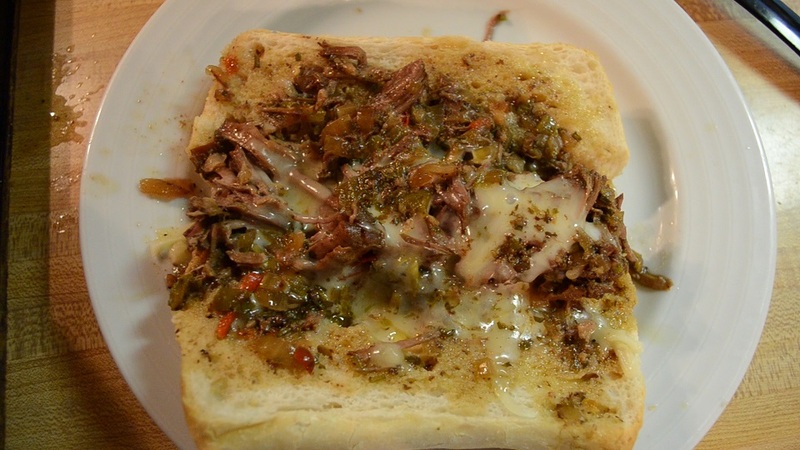 Being a Chicago area resident, I think this recipe represents what a typical Chicago style Italian beef sandwich is like with a slight alteration in the substitution of a chuck roast in place of the typical top/bottom round roast. Heat grill indirectly to about 300 deg F.
Mix rub ingredients (garlic, herbs, and black pepper) together with enough olive oil to turn into a paste rub. Apply paste rub to meat. Place rubbed meat in dutch oven (without lid). Cover with onions and peppers. Place dutch oven without lid on grill. Close grill. Add 1 cup beef broth to dutch oven. Put lid on dutch oven. Close grill. Cook for additional 3+ hours or until meat is fall apart done. Bring dutch oven inside to stove top. Add remaining 2 cups of broth. Slow simmer until ready to eat. Make sandwich. Put meat mixture on roll, add cheese, and ladle extra gravy on top. Sounds really good. I will give it a shot! An interesting take on a classic Italian beef sandwich. I'd have me a bite of that if I were there. They look delicious! I usually stop at Portillos to get my Italian beef sandwich fix when I'm in Chicago. I have to try these. Got a Portillo's down the street. Good stuff, but I think mine is better. Of course, I could be biased. Thanks for posting Lar, just decided to try in my new DO soon. Have you ever tried Johnnys Beef? Know person who cooks the beef there, and this recipe is very close. I love Johnny's Beef (as well as Al's beef), but it's a long drive in traffic to get there. This is why I make my own. I am curious as to how close I am. I reverse engineer many of my clone recipes (e.g. beef, pizza, breaded steak) by taste alone and I think I'm pretty close. Thanks for the great video. Can't wait to give this a try. I just had lunch yet this still made me hungry! Hard to find anything wrong with this sandwich. Great job. Finished the leftovers last night. This is definitely on my short list of weekend recipes. Looks great. I may give it a try this weekend. That looks tasty! This past weekend I tried the spicy Italian beef with pepperoncinis, that was posted on here a few weeks ago, and it was killer but I don't like using the chuck roast, I may have to give your recipe a try as well and see which one I like best, and of course use a round roast instead.